The government while admitting that the cost of living had gone up , pledged yesterday to bring it down soon. 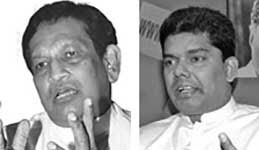 Responding to questions at the weekly Cabinet Press Briefing at the Parliamentary Complex, Health Minister Rajitha Senaratne said that inflation had driven up the prices of goods and services, but it would be lowered before the year ended.
" I agree that the cost of living has risen " , he added. Senaratne said that once the European Union granted the GSP Plus facility which was expected in a few months time, revenue would increase and contribute to reducing the prices of essentials. In this regard, a proposal made by Minister of Prison Reforms, Rehabilitation, Resettlement and Hindu Religious Affairs D.M. Swaminathan to revolve recoveries was approved by the Cabinet of Ministers on Tuesday, he said.